The Fellowship was fortunate enough to obtain a copy of TEN GRAND #1 from Image Comics. J. Michael Straczynski writes and Ben Templesmith draws. Joe used to be a mob enforcer, until he died. Since then he’s been trying to make up for his previous sins. Now he’s got a case before him which involves a dead man like himself, a man he personally killed right before he died. This James guy was into some really nasty stuff, too, demonic stuff. So maybe Joe will get his chance to make amends. I love a first issue that really sets up the backstory; it gives us a great opportunity to meet and get to know some of the players. And this one does a wonderful job of that. JMS uses a skillful combination of narration and flashback to show us who and what Joe is, and he gives us a sense of what’s at stake. This issue sets us up for what looks to be a delightfully complicated redemption story. 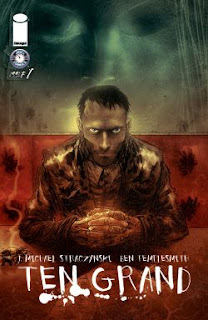 And there’s no arguing with Templesmith’s art; it’s beautiful. The relaunch of the Joe’s Comics brand appears to be in good hands. This book has the potential to be a solid base for said relaunch. I’m looking forward to seeing more. TEN GRAND #1 is available now at your FLCS or by order at imagecomics.com.